KidTripster Teen: From ice climbing to bear viewing, here are my 7 favorite things to do in Alaska. There are very few things that I won’t try - at least once. I’ve hiked in remote China. I’ve abseiled into glow worm caves in New Zealand. I’ve paraglided over Nepal. But for my money, Alaska offers the best collection of adventure activities for intrepid families anywhere in the world. Here are my 7 favorite things to do in America’s Last Frontier. Take a look at a map of Alaska. What don’t you see? That’s right, roads. There are very few roads in Alaska. Some areas - typically the most pristine locations - are only accessible via bush plane. Flying in small prop planes outfitted with floats for water landings, oversized tires for beach landings or skis for snow landings is a way of life in Alaska. So while you’re there, why not travel like an Alaskan? My family and I took a flightseeing tour of Denali National Park with Regal Air. We departed on the 3-hour, round-trip flight from Anchorage’s Lake Hood, the busiest seaplane base in the world. Our bush pilot manned the controls of the small, six-seater float plane. I appreciated my mom’s choice to book this flight rather than take the alternative, 12-hour bus ride into the national park. We were blessed with a clear day (which is not the norm on Denali) and were able to clearly see the tallest peak in North America. I think that the plane tour was a better way to really experience the grandeur of the mountain. On the way back, we landed on a jade green lake just outside the park for a short break. When we took to the skies again at around 8 p.m. on this particular summer evening, we saw at least 30 moose wading in ponds below. It was pretty spectacular. Granted, I’m not the best climber, but my favorite activity in Alaska was climbing on the ice faces of Root Glacier at Wrangell-St. Elias National Park in eastern Alaska. We booked a private, full-day tour with St. Elias Alpine Guides based at Kennicott Glacier Lodge near McCarthy, Alaska. No one in my family had ever ice climbed, but our guide Harrison helped us every step of the way. We hiked with our gear (included in the tour) - backpack, climbing boots, and crampons - about two miles on a trail that lead to Root Glacier. From that point, we switched into our boots and watched as Harrison showed us how to put on our crampons. We hiked another mile to our first climbing site - a towering, vertical ice face. With an ice tool in each hand and plenty of advice and belaying from Harrison, I slowly started up the ice wall. I really felt accomplished when I reached the top, but that wasn’t the best part of the trip. If you have the opportunity, ask your guide to lower you into a moulin, a vertical shaft in the ice. The moulin that Harrison brought us to went down about 100 feet. As I descended, I could see the ice gradually change from white in color to a brilliant blue. And then I climbed out, again, feeling pretty proud of myself at the top. Yes, it takes guts to ice climb, but it takes some serious courage to jump into a glacial blue pool! Again, our guide Harrison from St. Elias Alpine Guides at Wrangell-St. Elias National Park knew just where to go. While he and our parents turned their backs, my brother and I changed into our swimsuits right there on Root Glacier. Then the moment of truth - 1, 2, 3, JUMP! I plunged into the icy water. I’ve never felt water so cold! Harrison said it was about 28° F. I couldn’t get out fast enough! Watch here. KidTripster Tip: Be careful when you climb out onto the ice. Glacial ice is very sharp. I accidentally slipped and cut my leg. Another great experience at Wrangell-St. Elias National Park was ice caving. An ice cave forms when water from a creek or river drills a hole into the side of a glacier, leaving blue ice exposed. The trek down was as much fun as going into the cave. The terrain is very steep; in fact, it was so steep that my parents decided to stay up top and entrusted my brother and I to our guide Harrison of St. Elias Alpine Guides. The descent was more of “ski” down loose rock to the opening. When we entered the cave, we could hear the rush of water and see the glacier overhead. As we ventured farther in, there were several “rooms” to explore. However, we only spent a few minutes in the cave as the spraying water was pretty intense. KidTripster Tip: No matter how warm the weather is, you’ll want to bring a rain jacket into the cave. I love to hike. My mom insists that I’m part sherpa. The more difficult the trail, the more I like it. The hike to Harding Icefield is difficult. From the parking lot at Exit Glacier inside Kenai Fjords National Park to the top, it’s 10.4 miles round-trip with an elevation gain of more than 3,000 feet, making it one of hardest and most rewarding hikes that my family has ever done. After beating your way through the mosquito-infested forest, you’ll find yourself in an alpine meadow - still with pesky mosquitoes. KidTripster Tip: There are bears in the forest. You could carry bear spray, but we simply tied a bear bell to our backpack. A bell typically gives bears enough warning, so that they can exit the area. Push farther on over the slushy (if you’re hiking during the summer) snow to the top. 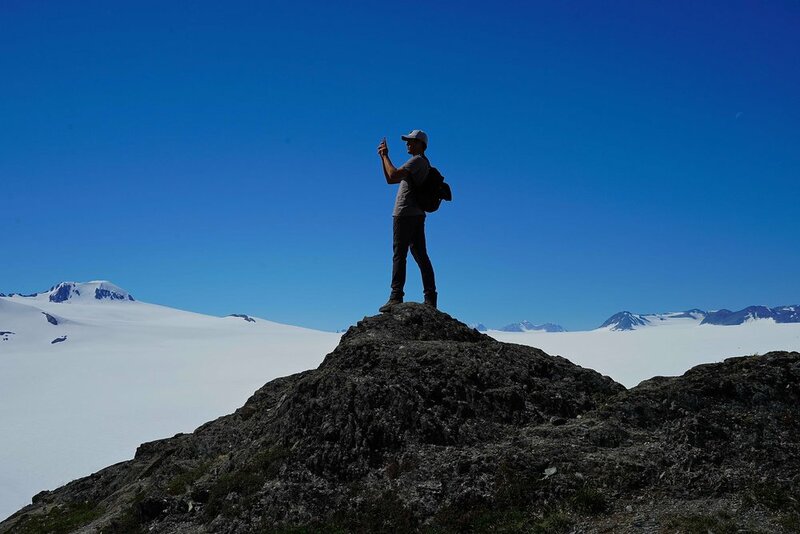 At last, you’ll be greeted by an expansive view of the 700-square-mile Harding Icefield. If you’re hiking at a fairly good clip, it will take you about 3-1/2 hours to reach the top; it takes another 2-1/2 hours to hike down. Climbing down is harder than you may think! 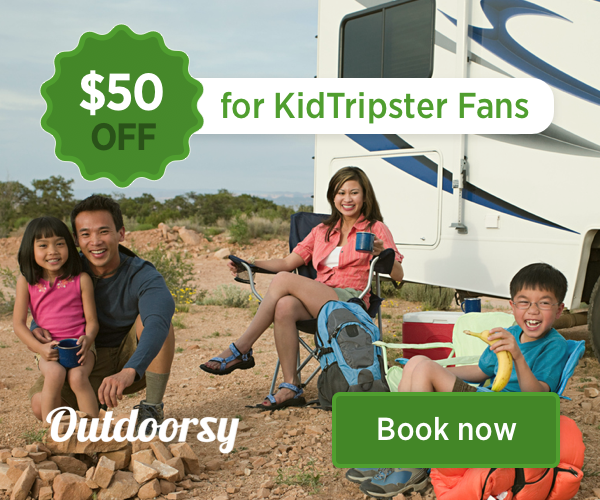 KidTripster Tip: Be sure to wear sturdy, well-fitting hiking boots, especially for the snow. If you have hiking poles, they’re helpful, too. Dress in layers. Even though there’s snow, you’ll be working up a sweat. KidTripster Tip: Bring at least 32 ounces of water. Once you make it to the snow-covered areas, you’ll find glacier-fed streams. The water is safe to drink here, so just fill up your water bottle. KidTripster Tip: Trail guides list this hike as 8.2 miles, but that doesn’t take into account the distance from the parking lot to the trailhead. As part of our Alaskan vacation, we took a week-long small ship voyage along the Inside Passage aboard Alaskan Dream Cruises. Part of the fun on a cruise like this is the ability to kayak right from the ship. We had the opportunity to paddle up to the base of Reid Glacier in Glacier Bay National Park. Trust me, you don’t fully appreciate the size of a glacier until it’s towering above you! Don’t leave Alaska without seeing brown bears in the wild. For that experience, we traveled with Smokey Bay Air from Homer to remote Lake Clark National Park. We landed on a rocky beach at Chitinina Bay. Dressed in waders, we went in search of bears. We didn’t have to wait long to find them. As we came upon a grassy meadow, we spotted about a dozen! We stood still and watched from about 100 yards away. As our guide explained, the bears have plenty of food in this area and are somewhat accustom to seeing human observers, so they don’t pay much attention to onlookers. On this day, we were treated to two, 7-month-old cubs playing and then nursing with their mother. I found it fascinating to watch the bears and how they interacted with each other. It was truly a once-in-a-lifetime experience. Nathan Shah celebrated his graduation from high school with this family trip to Alaska. In the fall, he’ll be an honors student at the University of San Diego studying mechanical engineering. This writer received some complimentary activities for the purpose of this review. However, all opinions expressed are solely his own. Shellie Bailey-Shah is the founder and editor of KidTripster.com.